Pretty independent house close to Fraginesi. The house has been furnished in a comfortable and welcoming way and it has 2 verandas, on the front and on the back, equipped for outdoor dinners. Distances: Castellammare del Golfo with all kinds of shops approx. 3 km, Scopello approx. 3 km, Guidaloca (beaches) approx. 3 km, Palermo airport approx. 40 km, the beaches are at approx. 3 km. At guests’ disposal: large and well kept equipped garden. Parking within the grounds. 100 m2. 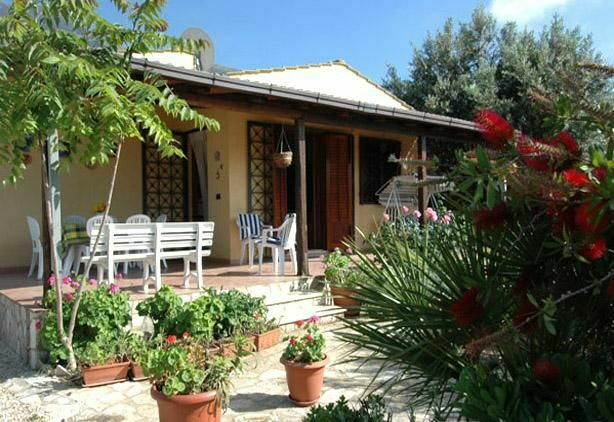 Ground floor: living room (satellite TV), equipped kitchen (refrigerator, oven, toaster) which has been decorated with typical Sicilian majolica, double bedroom, 2 bedrooms with single beds, bathroom with shower (washing machine).